Using WordPress as a Content Management System opens the doors to many types of web sites, and online store fronts are no exception. With a quick 5-minute WordPress install, and one of the plugins shown below, an online store can be setup very quickly and inexpensively. In a sense, the store can be free after you have established a means for getting online (a computer and Internet connection), and a place for your web site to reside (hosting and web site address). With the hosting and site address (domain name), you can get get started with an online store in a very short time for less than $20 and with no additional cost for another month. Domain name costs are in the ball park of $10 per year and it’s easy to find a shared hosting package for less than $10 each month. Paying hosting for a year or more in advance can net even better deals, sometimes as low as $5 per month. The software (WordPress and the shopping cart plugin) is free of charge. In some cases there are Pro versions or add-ons (free or paid) to extend the functionality, but the freely available versions are often enough. Even if you have to pay someone to set everything up for you, you can probably be up and running within a day or less for less than $100. Now let’s have a look at a few of the many options available for WordPress plugins that are free. 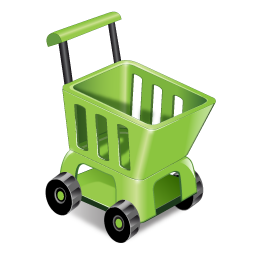 The Simple WordPress Shopping Cart plugin comes from the developers at Tips & Tricks HQ. It uses PayPal (a common payment gateway – it’s free and fast to create a PayPal account where you can begin accepting credit card payments immediately) for payment processing. PayPal takes a cut of every transaction. But it beats having to pay merchant fees, and almost everyone is familiar with PayPal. You can spend the money earned from your store with other PayPal merchants, transfer it to a bank account for free, or get a PayPal debit card which behaves as a MasterCard and takes from your PayPal balance. Now, you can login to PayPal and create “Add to Cart” buttons that will generate HTML code to be pasted into your website, but this simple PayPal plugin makes the process much simpler, and takes it even further. The plugin was developed to work with digital files that are auto-delivered to customers after purchase. It also works with physical products and the customer’s shipping information is collected during checkout at PayPal. When using a PayPal button (manually created from PayPal) you can provide a URL to a page on your web site that verifies and processes the transaction and provides the digital product for the customer to download. This requires programming knowledge, bug testing and more. All that has been done for you and is available for free with this software. If more advanced options are required, like more payment options for customers (such as Authorize.net, Manual Checkout, and others), coupons, etc., Tips & Tricks HQ has developed a premium plugin that is available for a nominal fee for unlimited use on unlimited sites. osCommerce is a very popular “open source” (which is what the “os” part stands for) online shopping cart tool that has been used for many years. The WP Online Store plugin allows users to make use of that software within WordPress. Integrating a store into a web site is very simple, and it has been designed to work with all themes. The plugin is feature rich and has recent updates as of this writing so it is clear that it is still supported. Like Simple PayPal Shopping Cart, both physical and virtual (digital) products can be sold in the store and be part of a single purchase. This plugin allows for coupon codes to offer customers discounts, has a built in tool for sending HTML newsletters, lets you apply different attributes like color and size to products, and much more. A great feature of this cart that can potentially increase conversions is the Amazon-style “people that ordered this, also ordered…” feature. Essentially it dynamically displays a list of products that other customer have ordered on each individual product page. It has advanced payment options and can handle transactions (and shipping, taxes, etc.) within the site rather than passing off that responsibility to the payment provider. There are advantages and disadvantages to this route compared to express checkout options. One downfall is that there is increased responsibility on the part of the merchant for keeping customer financial and personal details safe, and an SSL certificate will be required creating an added expense. There are paid add-ons for this plugin offering extra shipping and payment features. The WordPress Shopping Cart plugin by Level Four is similar to other plugins in that it offers the ability to sell both digital (auto-deliverable) and physical (shippable) goods. It also allows for the sale, and of course use of, gift cards. Something unique to this software is that it offers downloadable desktop software to manage the features of the store. Some people enjoy the ease of managing an online store when the management area and front end are part of the same web based application. Others find it clunky. Level Four provided a solution by offering a free management tool for use on desktops/laptops, Macs, iPads, Android devices, etc. Unfortunately there is no payment gateway option (not even standard PayPal) out of the box. So, essentially it is a catalogue plugin by default. Payment gateways can be integrated manually for express pay but it is highly inconvenient. A paid option is necessary to get built-in gateways which include: Authorize.net, PayPal, Versapay, Chronopay, etc. WooCommerce is very feature rich plugin created by the WooThemes team. It is available for free and there are even free themes that were designed for the store plugin to integrate with. However, it will work with other themes, plus there are premium store-front themes available from Woo as well. Unlike the WordPress Shopping Cart plugin by Level Four, this plugin comes bundled with a decent set of payment gateways, so there is no need for manual integration or to buy add-ons just so the store can be a store. The PayPal Standard Gateway comes bundled by default as any online store software should. Mijireh Checkout is available which offers the ability to accept credit card payments from Authorize.net, Stripe, SagePay, eWay, and others (including PayPal). There are also a few “offline” gateways built right in. Shipping options include: flate rate, free, International, local, plus pickup. Another interesting feature is the ability to offer coupons to customers as a reward for telling others about their purchases (on the social networks). Plus Sharedaddy and ShareThis is integrated for product sharing. Another popular free online store plugin for WordPress with almost 100,000 downloads, is TheCartPress eCommerce Shopping Cart. This plugin creates new “customer” and “merchant” user roles within WordPress, and it integrates into a WordPress Network nicely and is compatible for use with BuddyPress. It modifies the WordPress dashboard to make management of the store simple. If creating a store with International customers it is flexible with International and custom price formats, International weight units and International taxes. It has been tested and works with the WordPress multilingual plugin, as well as qTranslate. Rather than integrate a product within a post or page, this plugin introduces a new post type for products. Like the other plugins discussed it handles both physical and virtual products. Additional features include: free shipping, discounts & coupons, a “recently viewed products” listing, and it handles cross promotions in many unique ways which can help to increase conversions. The option is also there to use the plugin as a catalog rather than a store. With a click, all “add to cart” options can be removed. Built in gateways for payment processing include PayPal Standard and Authorize.net. Additional plugins can be added to extend the payment processors to include: PayFlow Pro and Link, BarclayCard, FreshBooks and others, with more developed often. It is encouraged by the developers to create “extended” plugins that work with this shopping cart plugin to improve upon its functionality. Start adding products and selling them from your own site. Best of luck with building your online WordPress store.